With the anticipated birth of a royal heir in 2013, the the Queensland Government is going into forelock tugging hyper-drive especially Attorney-General Jarrod Bleijie, says Dr Glenn Davies. Campbell Newman is doing what conservatives always do in Australia, cynically changing the rules to retain their grip on power. Since the election of the Queensland LNP Newman Government on 24 March 2012 there has been a steady output of ideological revisionism aimed at bolstering the concept of monarchy in Queensland. insisted Queensland pass individual legislation to ratify the royal succession change rather than a blanket federal approach. The hand behind these changes appears to be the Queensland LNP Attorney-General Jarrod Bleijie, the second-term Member for Kawana who turns 31 on 25 January 2013. It’s worth remembering the ALP interregnum came to power in 1989 with the execution of the Bjelke-Petersen government. Just over 22 years later, the conservative Restoration has begun moving the ideological clock back by changing Senior Counsel back to Queen’s Counsel and revisiting moving the Labour Day public holiday to late in the year rather than the Queen’s Birthday holiday. Perhaps all state schools will be required to hang a picture of the Queen in their school hall (or principal’s office) or the playing of the royal national anthem will resume in cinemas before the feature. Goodness knows. As the Newman LNP government come close to the end of their first year in office it seems the ideological clock continues to spin backwards. But how much support is there for the Queensland LNP Government showing its monarchist colours in Queensland? On 6 February 2012, Queen Elizabeth II marked 60 years since her ascension to the throne; at the time, I wrote that it appeared most ordinary Australians couldn’t care less. The Australian Monarchist League had been trying to raise interest in celebrating the Diamond Jubilee in Australia since 2009 but no one seemed to be interested. It seemed the monarchists appeared bemused and a little confused as to why there hadn’t been any action in Australia at a government level to celebrate the Queen’s Diamond Jubilee. 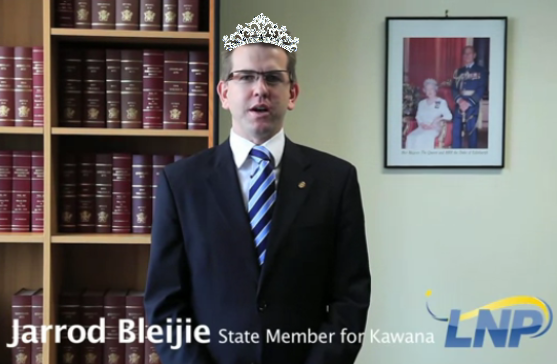 In the week of the Diamond Jubilee, Jarrod Bleijie announced plans to reintroduce the title of Queen’s Counsel for senior barristers. The Newman State Government is showing its monarchist colours with Queensland set to become the first state in Australia to restore the title of Queen’s Counsel. After nearly two decades of Senior Counsel, the state’s top barristers are expected to soon resume the old title, QC. The title QC dates back to the late 16th century, when Sir Francis Bacon was appointed the first Queen’s Counsel. When Queensland decided to dump the title in 1994, it was riding the wave of modernism that was sweeping though many Commonwealth and former Commonwealth countries. It was replaced in many places with various permutations of Senior or State Counsel, with no apparent loss of efficiency or purpose. The Bar Council of the Queensland Bar Association has confirmed to the Attorney-General’s office its in-principle support for the proposal to recommence the appointment of QCs, and the matter is expected to go before Cabinet soon. On 6 June 2012, the Queensland Bar Association president Roger Traves SC acknowledged in a letter to members that some might view the move as pro-monarchist. The arguments against included that the stance was pro-monarchy. This seems to have taken some members of the Bar Association by surprise, because it had not been an in-house issue for years and there was no public mention of any such proposals before or after the conservative Restoration. The announcement that Queensland senior lawyers would replace Senior Counsel (SC) with Queen’s Counsel (QC) was made by Jarrod Bleijie at the Supreme Court’s annual Christmas Greetings event in Brisbane on Wednesday, 12 December 2012. This event came close on the heels of the official opening on 3 August 2012 of the new Brisbane’s new Supreme and District Courts by the Attorney-General, Premier, Governor and Chief Justice. These new courts were named by the Queensland LNP Newman Government: the Queen Elizabeth II Courts of Law. In July 2012, the Premier’s Department confirmed the Queensland Government logo would be slowly phased out and replaced with Queensland's official coat of arms on correspondence. The logo was introduced in April 2000 by the Beattie Government and was designed by architect Michael Bryce, the husband of Australia's Governor General Quentin Bryce. It was commonly referred to by public servants as the "Beattie burger", because the relaxed style of the logo looked like a hamburger with several chips or french fries sitting beside it. The Queensland logos: everything old and outdated is new again. The 2012 Queen’s Birthday long weekend in June was to be the last after the former Labor government shifted the Queen’s Birthday holiday to the first weekend of October, while retaining a one-off Queen’s Jubilee public holiday in June 2012. During 2011 there had been widespread consultation on changing the holiday system and it was agreed that Labour Day would remain in May. At the time Premier Anna Bligh said all holidays, except for the Queen’s Birthday, marked significant dates and were punctuated with official ceremonies or significance. Unlike other public holidays, it’s not celebrated on a date that is particularly meaningful. However, Labour Day has special significance for Queensland because of its links to events in the labour movement of the late nineteenth century. All this was thrown out the window and legislation recently passed through the Queensland Parliament moving the Labour Day public holiday to the first Monday in October and the Queen’s Birthday public holiday back to its previous June timing. The change in attitude towards the public holiday timetabling suggests the Newman Government is determined to take an ideological stance against the union movement in favour of the British monarchy. Thirty-five years ago, Premier Joh Bjelke-Petersen sought to make Queen Elizabeth II not just Queen of Australia but also Queen of Queensland. It was an arcane attempt to thwart any attempt by Canberra to turn Australia into a federal republic. At COAG in December 2012, Premier Campbell Newman drew on the ghost of Joh when he reserved Queensland’s right as a Sovereign State to amend its own laws regarding the change to the royal succession to allow a first-born daughter of Prince William to inherit the throne before any later-born sons. Rather than deferring to the Commonwealth to make this change, Newman and Bleijie insist that, because the states boast their own viceroys in the form of governors, then Queensland should be allowed to pass its own legislation. Theirs is a lone stand in refusing to refer state powers to the Commonwealth in an effort to maintain an individual relationship with the monarchy. Given the longstanding ties and relationships between the Crown and States, it is appropriate the States should preserve this relationship through their own legislation. The decision could ultimately throw a spanner in Commonwealth member nations achieving a unanimous decision so that royal succession laws can be changed. The Commonwealth’s ‘very loud and very clear’ legal advice was that there was one crown in Australia, represented by the Governor-General and state governors, not many crowns . The LNP conservatives appear to be hoping that moving around the deckchairs and giving them royal names will help them retain their grip on power. But all of this effort by Jarrod Bleijie and his high tea warriors will not be able to stop the rising demand for an Australian republic. Ultimately it simply makes them look foolish. King Canute couldn’t hold back the tide nor can the Life Member of the Australian Monarchist League, the Queensland LNP Attorney-General Jarrod Bleijie.